I’ve always had my head in the clouds. Well, more accurately, in Outer Space. Since childhood, space travel and astronomy have been loves of mine, and I took every opportunity to explore them. To me, the most important thing Humankind will ever do is leave our Solar System and explore the galaxy & universe. Another area of interest for me has always been ethics, and the general observation & analysis of how people operate, especially in sticky situations. Pretty nerdy, huh? So yeah, it was lonely growing up thinking about this stuff. The good news was: Star Trek existed. Here was the killer combo of space travel AND ethical explorations—in like, every single episode, and awesome (albeit sometimes cheezy) costumes to boot! 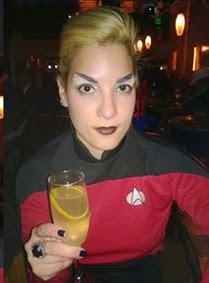 As I got older and got out there into the real world more, I found other people who had as much fervor for the Star Trek world as I did, and who were just as inspired by it. Some of my best memories are of donning my Star Trek TNG red shirt, black pants & black leather boots and walking through Greenwich Village during the Halloween parade. I’d run into Klingons—even Cardassians!—and I’d have a sense of belonging I wouldn’t have anywhere else. That’s the power of being part of a community. I can do things and be free to express myself in ways that might otherwise be considered too silly or weird. When you’re expressing yourself to people who “get it,” it doesn’t feel weird at all. The Star Trek community—whether at conventions, random conversations, or online—provided a sort of haven for adventurous topics of conversation and dress. The existence of such a community has had a marked impact on me as an artist and musician. Namely, it’s meant that there’s a whole group of people out there who’ll get some of my musical and sartorial themes. My style and lyrical content might be “out there” to some, but to other Trekkies, it’s familiar. I can feel more comfortable knowing that when my song “M-Class” plays, someone out there will know I’m *not* talking about a Mercedes, but a type of planet that can harbor humanoid life. I can use terms like “engage” and “warp speed” in my lyrics and I know someone’s ears will perk up. And I know that once in a while, a viewer will catch things like “the Prime Directive” in the slide presentation in my video for ”Miss Communication.” Every time I include stuff like that in my music, I’m speaking directly to others in the Star Trek community with whom I’ll always have a special connection. Aside from specific references, my connection to the Star Trek community has also made me feel more comfortable writing what some have called “thinker’s pop music.” A lot of Trekkies tend to be folks who like to think; they dig philosophy, technology, and subjects that go deeper than money, fashion and small talk topics. So, while lighthearted “fluffy” tunes might be the music of choice for some, it likely won’t satisfy your typical Trekkie. This gives me the opportunity to sing about people & society in my natural observational manner and know that there’s an audience to appreciate it. But what’s even more amazing about Star Trek is that it hasn’t only un-weirded (ok I know that’s not a word) my music & style somewhat; to a degree, it’s popularized it. Since the smash hit releases of the 2 latest Star Trek films, people think it’s awesome that I named my dog Khan, or that I wear metallic outfits and talk about outer space in my songs. I was always proud of my love for the world of Spock & Picard, but now I can even be considered “cool” for it. And that’s…pretty damn cool. Fab post. I hope you have Ms. Aradia return as a guest blogger. Her words ring true and it feels like she's coming from a very authentic place in herself.